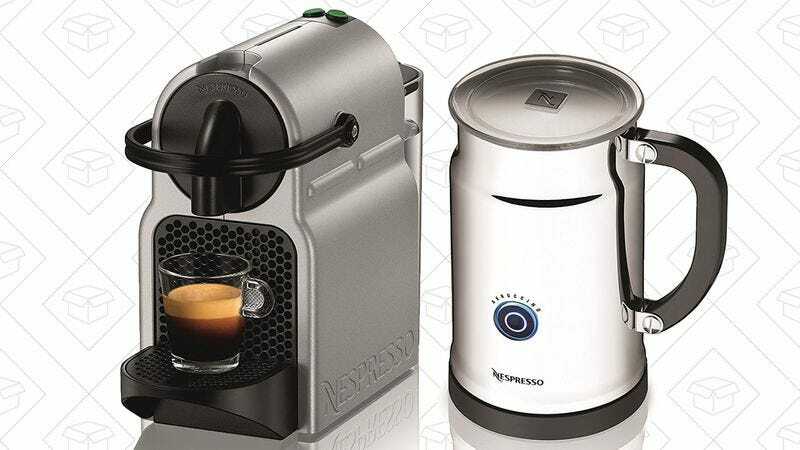 Hands down, Nespresso is the easiest way to make decent espresso at home, and their space-saving Inissia model with included milk frother is down to $93 today on Amazon, the best price we’ve ever seen on the frother bundle. If one of your new year’s resolutions is to finally start running, this Garmin GPS watch can track your routes, calories burned, heart rate…basically everything you need to shame yourself into going a little bit further. $160 is the best price Amazon’s ever listed, so I’d sprint over to the site to lock in your order. You know when you ask someone to take a picture of you and your family on vacation, and you quickly learn that almost nobody understands how to take a decent photo? With a mini tripod, you can be in total control of those long range selfies, and this $9 model from Aukey works with everything from DSLRs to smartphones. Zojirushi makes some of the best vacuum-insulated bottles around, and this 17 ounce model has never been cheaper. It’ll keep your drinks hot or cold for hours on end, and look really cool in the process, but note that this deal is only available for Prime members. Anker makes the best gadgets for keeping all of your new toys charged, and several of their most popular battery packs, chargers, and accessories are on sale today. There are too many deals to list here, but head over to this post for all of the products and promo codes.